I love dilemmas. They are the heart of this game. Storywise, dilemmas represent the risks you take while you are boldly seeking out new life and new civilizations. Creating a new dilemma is always bit of risk too. If it's not effective, it takes up a slot in an expansion that could have been a more impactful card. But if it's too powerful, it can warp the metagame in an unexpected way, because every deck can have access to it. One way to try and balance a dilemma is to make one that won’t necessarily affect the worldwide metagame, but can be very effective responses to your local meta or a specific tournament. Another is to make a dilemma that has a high upside, but has the possibility of doing nothing. Today, I get to reveal a dilemma in A Time To Stand that combines both of these design strategies. This dilemma was inspired by the missions matter theme of the expansion and wanting to make that little number right in the bottom centre of the mission be more important. Span on a mission is something that good players already know is important. I have heard players dismiss the possibility of using a new mission simply because the span was 4, and those same players design their decks to use a certain space mission just because it has a span of 2. Well, this dilemma is designed to make those players second guess themselves a little bit. Add the span of this mission to this dilemmas cost. Randomly Select 3 personnel. Each of those personnel with an attribute >6 is stopped. Since the lowest span a mission can have is 1, at its best, this dilemma could stop 3 personnel for the cost of just 1. This seems like a pretty unlikely scenario until you take a look at what span 1 missions exist. Two of the four attemptable span 1 missions see some amount of competitive play. Assimilate Resistance is often used in Borg Assimilator decks.The great thing about playing Becalmed on an opponent's mission attempt at this mission is that, due to the high attributes of Cunning>42 or Strength >40, the Borg will often have their drones being pumped up by Computation Drones or Opposition Drones. If they have two of either, it basically makes Becalmed auto stop 3. The second important span 1 mission is Rescue Prisoners. I can’t remember the last time I played against a Klingon deck that wasn’t using this mission. The fact that they have all the skills for this mission on a non-unique personnel would be good enough to use it often. But add to that the fact that its span is only 1 and that Khamis provides almost a quarter of the total strength needed for the mission by himself; makes this mission almost an auto include. Considering the fact that Klingon decks have quite a few personnel with strength >6 and that Khamis himself is one of those personnel; makes Rescue Prisoners one of the best missions at which to throw a Becalmed into your dilemma stack. I won't go into as much detail, but there are quite a few space missions with only a span of 2 that are used regularly also. Caretaker’s Array, Kressari Rendezvous, Practice Orbital Maneuvers, Rescue Prisoners of War, and sometimes Wormhole Negations all see play. Probably the most notable are Practice Orbital Maneuvers, since cadets often have their attributes boosted above 6 at this mission, and Rescue Prisoners of War, because the Dominion are almost guaranteed to be attempting this mission with some Jem'hadar. I’ve taken a lot of time to show some best case scenarios for Becalmed, but I want to talk about a few other things to note about this dilemma. First, since the printed cost on the dilemma is actually 0, it can’t be prevented by Dr. Reyga, Donatra, Giotto, Jonathan Archer, or even Assess Contamination. And it also means that Vault of Tomorrow can dig it out of you dilemma pile, if the opponent is attempting a planet mission (which fortuitously often have low spans). Some words of warning about Becalmed, though. It does have the possibility of doing nothing. It's higher on the risk/reward scale than some other dilemmas. 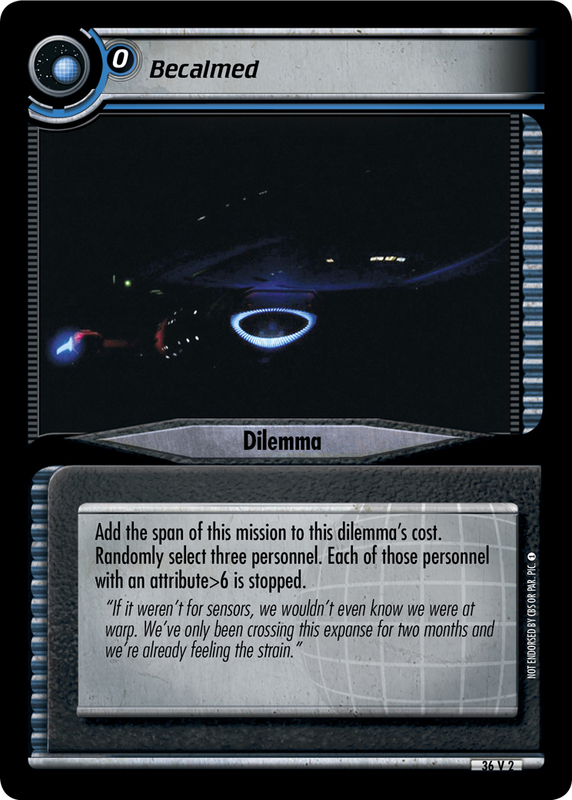 The main requirement for playing this dilemma is having an opponent using some ways to increase his personnels attributes, such as Enterprise-J, or be playing an affiliation with naturally high attributes, like Dominion or Klingons. That being said, there are a few ways that you can try to make this dilemma more likely to stop some personnel. Trelane’s Trial might be worth using in a dilemma stack to proceed Becalmed, since it removes a personnel that wouldn’t be stopped by Becalmed. Becalmed is designed for the kind of player that likes to gamble with high risk, high reward strategies. If that sounds like you, then maybe it's time to Raise the Stakes.